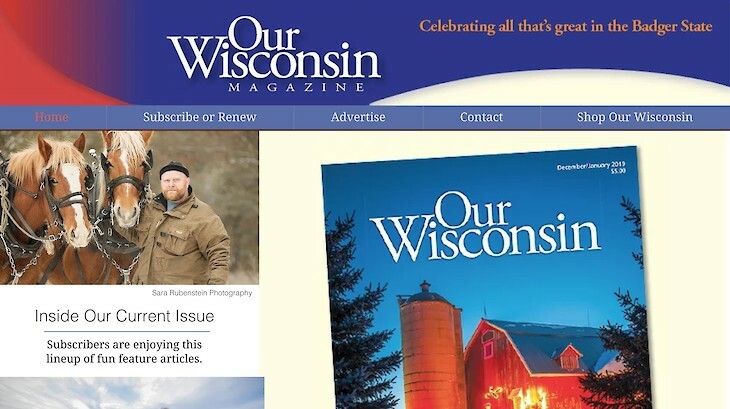 Editor's Note: This article by Diane Dryden was originally posted on January 12, 2018, and is being re-posted to honor the fact that this article has been published in the Our Wisconsin Magazine! 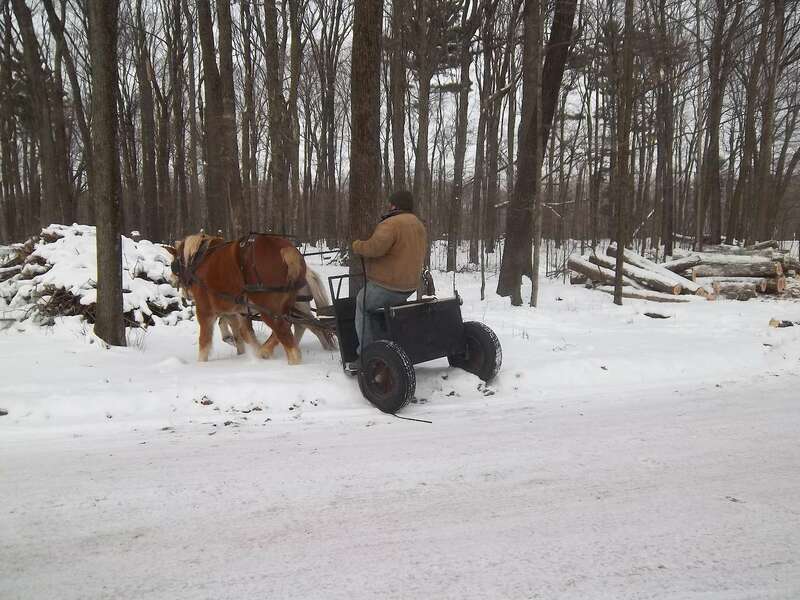 In today's fast-paced world, it's startling to glimpse a team of horses traveling through a woodlot hauling logs. 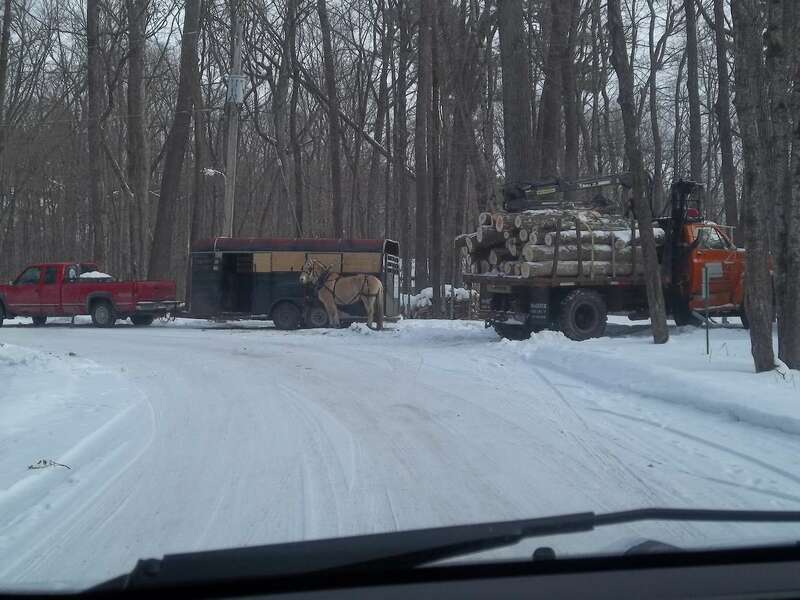 But if you happened to drive on North Lake Drive in Shell Lake a week ago, you would have seen just that, horses and their owner logging out some of the Elwood Beach Road lumber. Taylor Johnson has returned to the woods a different man than he was twelve years ago. Back then his brother and their father steadily burned themselves out working the lumber business with their large and bulky state-of-the-art equipment and a dozen crews working for them and Taylor's goal was always to go small, much smaller. But a series of tragedies changed resulted in some dramatic decisions, and today you can find Taylor back to his original love, logging with horses. He grew up in the business and, even as a child, taught his dog to pull a wagon mimicking his father who logged with both horses and mules. He's come full-circle and now prefers to work with landowners developing extended range plans for their timber, taking the trees that are old and junk to let the other varieties grow and mature into wood worth harvesting. You might call it Forrest Management. You wouldn't think he would be very busy, but through word-of-mouth, he manages many properties and still has some to take on new clients. "These horses can work seven or eight hours a day and work until they're twenty, if they're well cared for," Taylor says while hitching up his team in the below zero temperature. 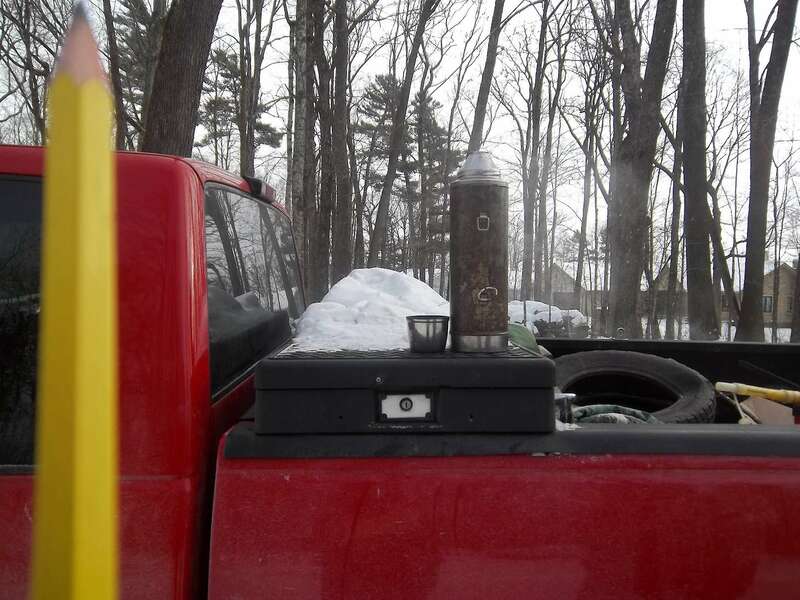 "They will start on a bitterly cold day even though motor's freeze and the truck won't start. The only thing they do need though, is one day off a week to rest, just like the Bible says we all should do." Taylor currently is using a large thirteen-year-old experienced Belgian horse named Mark, and training in two Norwegian Fjord horses named Fiona and Phoebe, ages five and six. These little horses are very strong and one of the oldest and purest breeds. Their manes are beautifully roached by cutting them to only two inches, revealing a color pattern similar to a skunk's tail. While they're training, Taylor brings all three to his work site each time so he and Mark can change off horses during training. Before the wolf population grew to what it currently is, Taylor would corral his horses and leave them at the job site overnight. Now they go home with him each evening. "Bears don't spook these horses, but if they hear one wolf howl, they're ready to leave. Another hazard is ground bees. They go wild when they run over a nest, and that's why, between late July through August, we back off of logging if the bees are bad that year." By watching Taylor and his team, it's easy to see that they all respect each other. 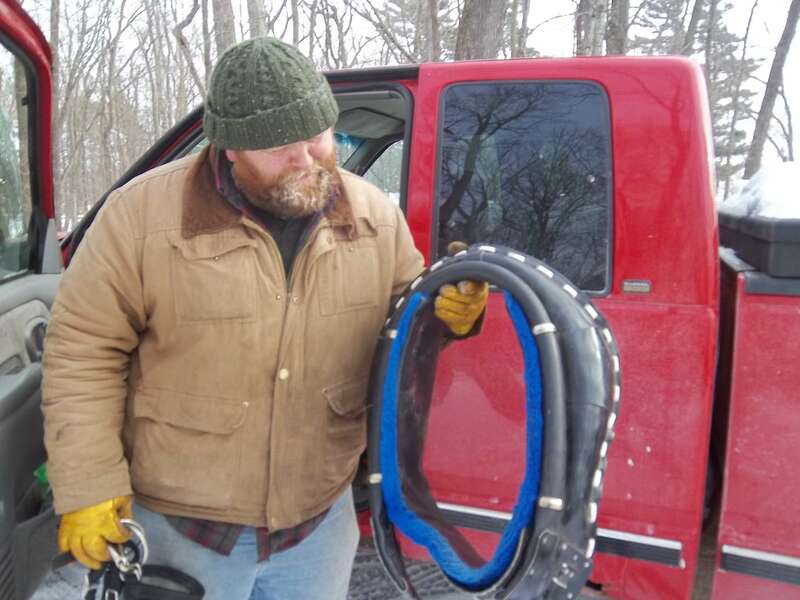 He speaks softly to them as he starts the harnessing process and on cold days Taylor brings a large thermos of hot water along that he uses to pour over their bits to warm them and keeps he keeps their collars in the still-running truck as another courtesy to his team. They, in turn, don't kick him when he stands in a prime position attaching the leather straps. They work well together because they listen to him, and he listens to them. When they enter the woods full of trees that Taylor has already sawn down, Mark prefers to the haul out the big logs first for some reason. "Just because he stands taller than I do, he can see farther and thinks he knows which logs we should to get first!" His popularity isn't limited to the local area. 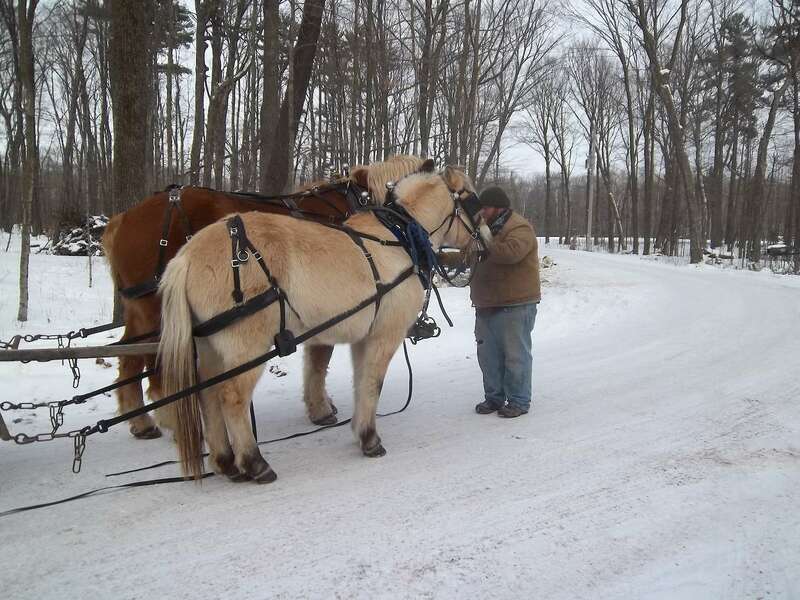 The team of man and horses has been covered by KARE 11's Boyd Huppert in his Land of Ten Thousand Stores, and by PBS who has followed him into the woods, their professional camera's in hand. Every other month he submits his column to the Rural Heritage Magazine that's published in Iowa. This popular publication covers everything anyone might need to know about horses and mules from trimming, clipping and repairing hooves to nutrition, breeding, and disease. The magazine has articles on logging with horses and even logging with oxen or donkeys or just logging in general. Taylor is one of the last of the horse loggers, but he has no plans to quit, especially now that he's connected with the Boy Scouts of America. Three weekends a year he works with the thirteen to sixteen-year-old Scouts teaching them how to log respectively with horses. He takes these boys with him into the woods and for some kids, it's a life-changing experience. One boy from the south side of Chicago saw a lifestyle he would never have imagined existed. Before he came to the area, he had only seen a horse in a park but took to the horses right away, and by the time the weekend was over, he was ready to buy his own team and start logging. He had even picked out names his future horses. Taylor's goal is to teach these kids respect. Respect for themselves and respect for the horses, demonstrating that when horses respect their owners, the horses will give all they've got to them. Taylor Johnson is carrying on five generations of Johnson loggers, and one thing he knows for sure is that his horses know their job and love to do it. Taylor and his wife Annie live in Springbrook, and they have four children. 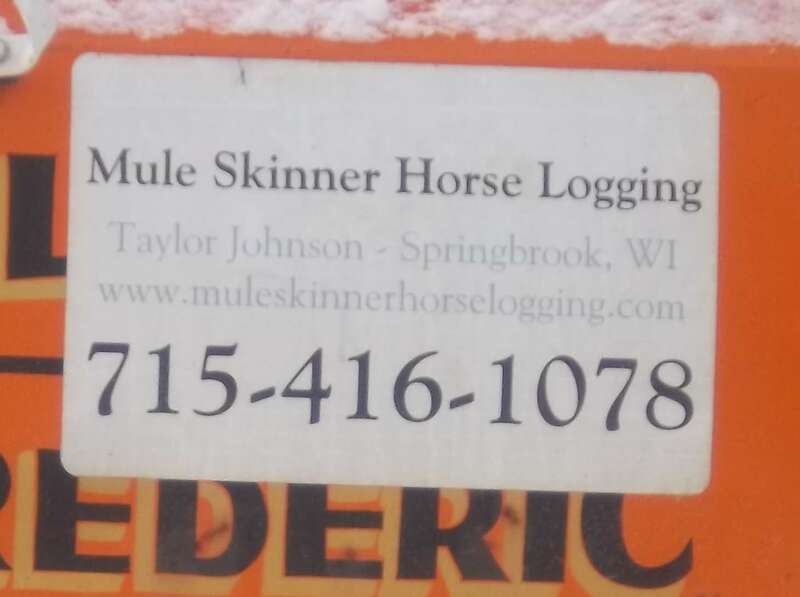 He's still got openings for logging large and small woods and is available for a conversation without obligation.